Finalmouse Air58 Ninja Review - Is It Worth the Hype? 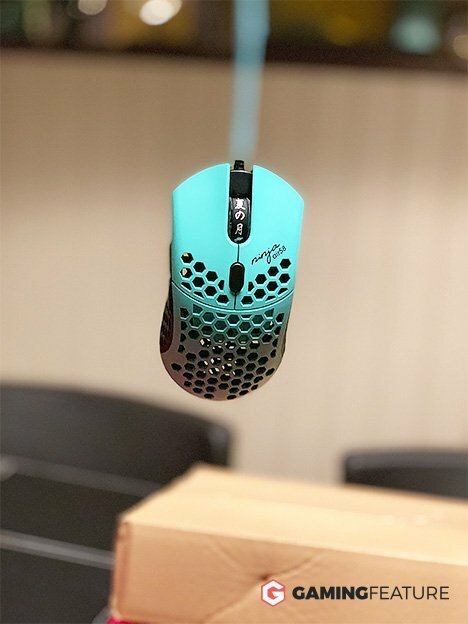 Finalmouse Air58 Ninja Review – Is It Worth the Hype? The best gaming mouse I have ever tried for someone who prefers a (very) light mice. 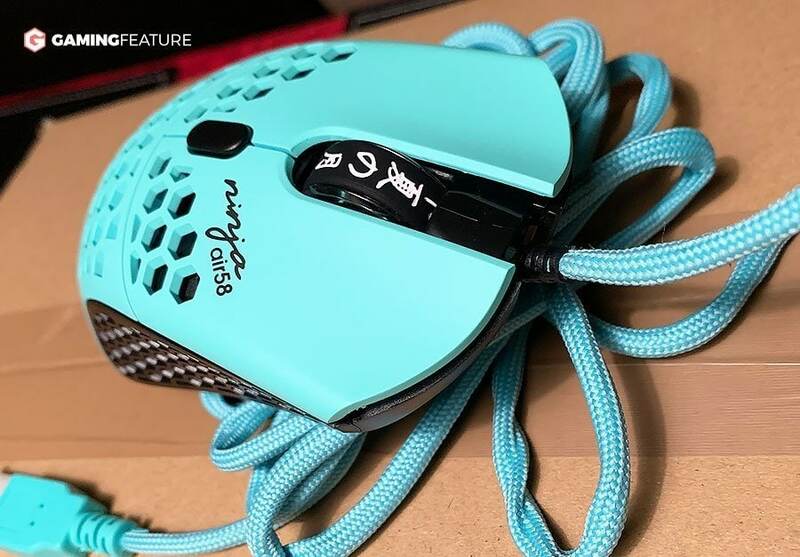 The highly anticipated gaming mouse – the Finalmouse Air58, a collaboration together with the popular streamer Ninja, is finally here. It’s a unique mouse that are trying to tackle the weight of the typical gaming mouse. Today I’m going to have a closer look, and if the Air58 is worth all its hype it has gotten on social media? In my testings, the review turns out to be quite excellent, but it has some minor downsides that I’m going to bring up. However, as it only weighs 58 gram (without the cable), the audience for this mouse gets rather niched, as this is probably the best gaming mouse I have ever tried for someone who prefers a (very) light mice. Myself thought that I was a more heavy mouse guy, but it turned out after a couple of days of gaming I could make more precise movements and faster reactions with this. So this review could either be great or worthless, depending on what your personal preference is. You see, this mouse is so incredibly light that it deserves its own category, it’s not if you like a light or heavy mouse. Rather if you like a ‘normal mouse’ or a ‘finalmouse’. 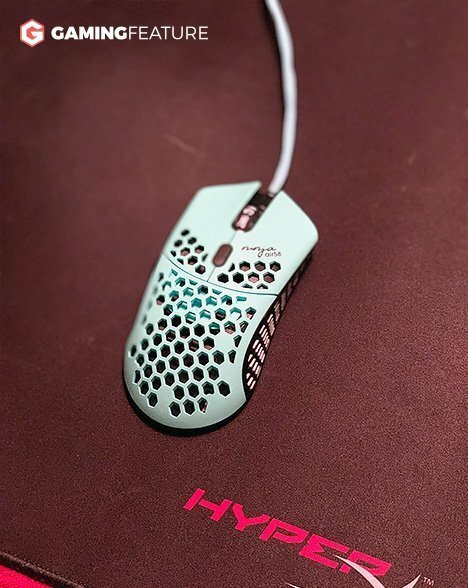 If you are a true gamer you have probably already heard about the brand Finalmouse by now. They have been releasing these very unique mice for the past years, that has been impressively light with a design that allows making it lighter than its competitors. 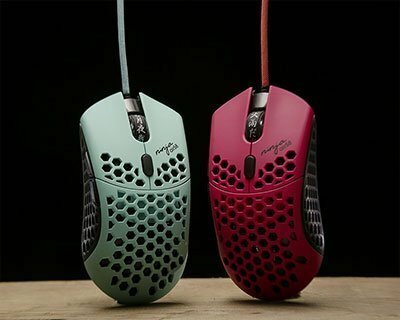 When it comes to the lightest mice on the market, Finalmouse has always been up for discussion. However, there has been one huge problem for gamers who are looking for it. Their products are often released in a very limited quantity. Why you might ask? This has resulted in their mice being sold-out after just a couple of days, and the only way to get it was thru aftermarket. The Air58 is no exception, just like the earlier Phantom mouse it was out of stuck in a matter of hours. Either way, let us get into the more technical parts! The Air58 was launched together with streamer and professional gamer Ninja on December 1st, and the shipping was unfortunately quite long. I have been testing the mouse for about a month now and feel quite comfortable with giving it a review. In terms of design, it’s pretty close to its previous model, the Ultralight Phantom. This time the mice are launched with the colors ‘Cherry Blossom Blue’ and ‘Cherry Blossom Red’, I only got my hands on the blue one as the red version was sold-out incredibly fast. To put it short, they are visually very nice looking and unique. The honeycomb patterned surface really sticks out to your normal gaming mouse. The number one feature of this mouse goes hand in hand with the design, the ultralight weight. With only 58 gram of weight, it literally feels like air using it. Mainly because the honeycomb pattern is cut out, getting rid of a lot of material. You can literally see thru the mouse from top to bottom. Also, the plastic feels very light as well. Compared the previous Phantom mouse it’s slightly lighter because on the Air58 it’s holes on the sides on the mouse, wheres on the Phantom it isn’t. The whole area of the bottom is actually also covered of holes, you got the idea. To achieve this weight they have made cuts, everywhere. Without much imagination, you could say this is not the ideal mouse for liquid. Getting liquid inside the mouse and its components are very easy and would probably fry the entire mouse instantly. I guess that’s the rule for most electronics but worth mentioning. Apart from its weight, there is another very unqiue feature. 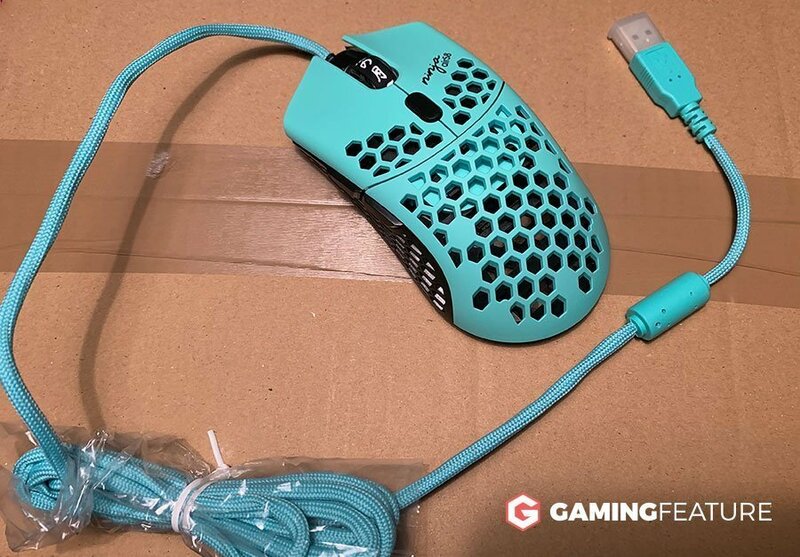 Because of their ‘Phantom paracord’ cable they have used for the mouse, they have solved another very annoying issue for serious gamers. Where’s a stiff cable is noticeable when doing mouse movements. Yeah, I know, this is something that has been brought up before by competitive players. However, I was very surprised with how flexible and unnoticeable the cable was, it almost feels like using a wireless mouse. It has an on-the-fly DPI button where you change the DPI settings. Many gaming mice today offers a software where you can change the DPI and keybindings but Finalmouse doest not. The DPI modes range from 400, 800, 1600 and 3200 DPI, and you have to feel on what settings you are currently on. It has no LED lights, which I appreciate and prefers a clean look over flashy colors. The shape of the mouse is quite large and reminds me a lot of the Razer Deathadder shape, which is great for contact with your hand. It has a top optical sensor called PMW 3360 with a 500hz polling rate. Most gaming mice today have 1000hz and can be a concern for some gamers. Personally, I think a difference between 500 and 1000 is very hard to notice. Either way, it’s a top-tier sensor so nothing to complain there. The biggest flaw of this mouse for me is the price. It definitely not a budget gaming mouse, with the limited amount of mice available the price could go even higher on a secondary market. The buttons feel very good and have nice noticeable feedback. Same with the side buttons that are large and easy to click with your thumb. The scroll wheel has this fancy design with various letters on it. I feel this is a nice looking scroll wheel, but it takes away from the usability. Getting rid of the usual groovy texture makes it less grippy and compared to other gaming mice it’s quite a difference. Either way, it does its job well but not the best I’ve seen. I really enjoyed this mouse, it was such a different feeling when first trying it out. It felt so light and easy to maneuver. After a couple of weeks of daily use, I tried the G502 and it literally felt so heavy and I have never thought about it being heavy before. The Air58 is truly a top-tier gaming mouse, and I could even see myself using this as an everyday mouse due to being so easy and light to your arm. So for a long period of time usage, this gets the highest score. What I liked the most was obviously the 58 gram of weight, the very unique paracord mouse cable and the over-all feel and look of the mouse. It made me perform better in competitive games compared to other FPS gaming mice. What I liked the least was it didn’t have any official software, like many maufactures have today. It’s not big deal, but if you are used to it – it will be missed. The sensor is 500hz polling rate instead of the more standard 1000hz (still a top-tier sensor for gaming). The pricing and number or released products, it makes it quite hard to get your hand on this product. If you’re not ready, you probably have to look at the aftermarket price. I would highly recommend this mouse, especially if you like light gaming mice and not quite ready to make the switch to wireless one. This is probably the closest you can come to wireless, that is still wired. The size and comfort are more suitable for medium or large hands, and it really felt exceptional for me that has a palm grip. Calvin loves to write about games and gaming hardware. He has been gaming for more than 10 years in his free time, mainly in the FPS genre where if finds competitive gaming the most enjoyable.